Hmm. Maybe Agency.com watched this David&Goliath-created Kia Soul commercial and heeded its tagline before they debuted their Skittles work. 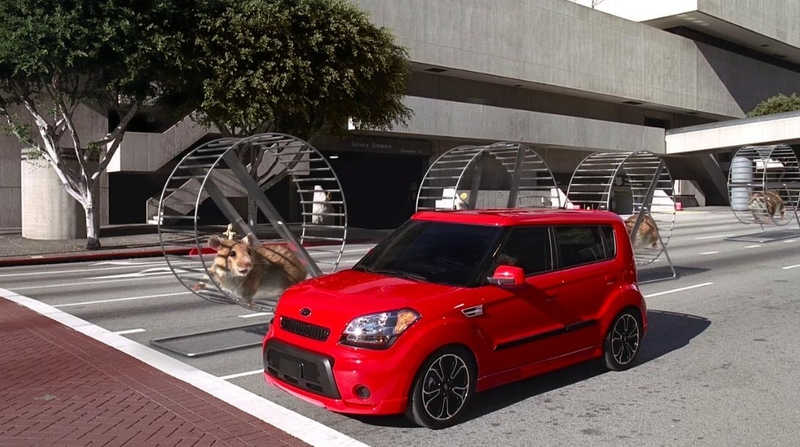 In this commercial, we see the mundane lives of frustrated hamster going about their daily routine played out until a group of hamsters have found...wait for it...a new way to roll pull up in a flaming red Soul. Sweet. And because credit should be given where credit is due, David&Goliath recruited a talented crew to work on this spot. From film, music video and commercial director Tarsem, to Whitehouse editor Ben Stephens, to Framestore London - an after vfx studio responsible for vfx in films like The Dark Knight and The Golden Compass - the commercial definitely had some high caliber talent. The agency also collaborated with Stan Winston's company, Legacy Effects, to create the hamster suits. They also worked with five different musician to create five variations of the commercial. At the end of the spot when the Soul window rolls down, music is heard. Each of the five spots will feature a different artist.